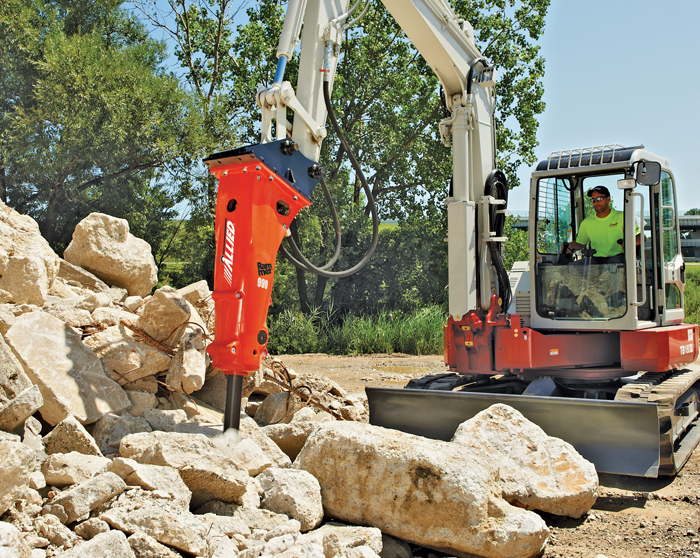 When it comes to mini excavator hammers and breakers, more isn’t always better. In fact, quality is significantly more important than quantity, in terms of productivity, cost-savings and life of the equipment. How do we know? We asked the industry experts like Allied, Atlas Copco and Montabert. Ten years ago, it was necessary to take the complete breaker back to the shop or to a dealer to replace the bushings. Now it can be done in five minutes in the field. 1. What Technologies Make Breakers Work? 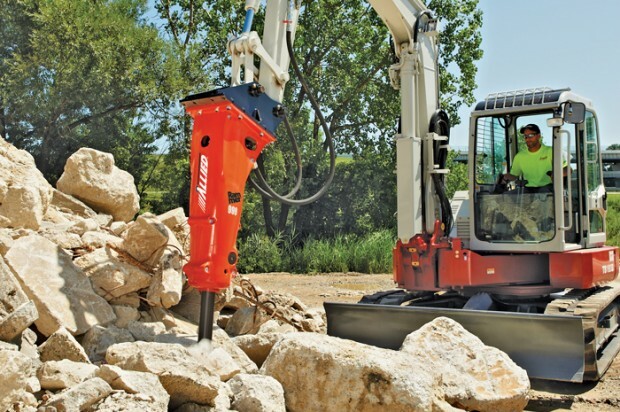 “A hydraulic breaker, as the name implies, operates as a result of the movement of hydraulic fluid supplied from the host carrier,” explains Kevin Loomis, business line manager, construction tools, for Atlas Copco Construction Equipment. “They are typically equipped with at least two hydraulic connections and are coupled to the carrier with an inlet/pressure hose and an outlet/return house.” The hydraulic oil directed into the breaker from the carrier is used to propel an internal piston that reciprocates and transfers percussive energy to the working steel, which is in contact with the material to be broken. “In more visual terms, the internal piston can be viewed as a hammer, and the working steel as a nail,” says Loomis. “When an operator activates the breaker, hydraulic oil enters its internal porting via the pressure hose and produces the force that drives the piston.” The hydraulic oil is then directed back to the carrier through the return hose. Other mediums, such as nitrogen gas (N2), within the breaker also can be used in the process to accelerate the piston against the working steel. “This varies by manufacturer and breaker size,” Loomis says. 2. What Are the Newest Advancements in Hammer Tech? 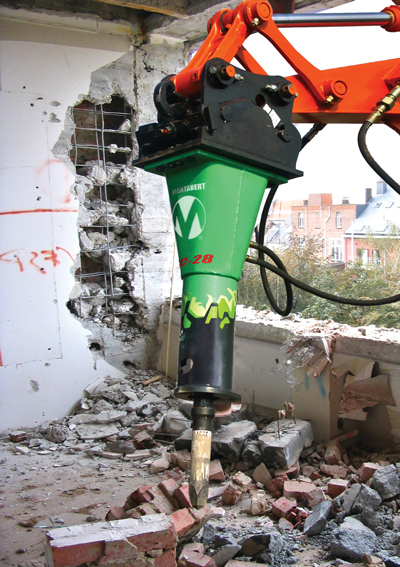 As hydraulic breaker designs have evolved, self-preservation features have been added to increase longevity and efficiency, as well as reduce repair costs. “This includes features such as AutoControl in the Atlas Copco range of medium and large breakers, which automatically adjust how hard the breaker hits, based on the density of the material being broken,” says Loomis. By delivering the correct amount of percussive force for the job at hand, the breaker does not need to run at full force at all times. This greatly reduces wear and tear on the breaker and lowers operating costs. Using the right working steel in the breaker is very important. 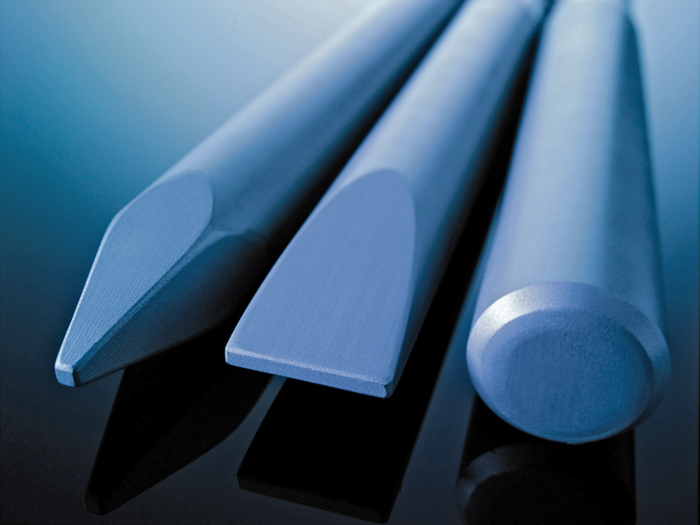 A chisel profile sends impact energy in a defined pattern, while a blunt tool sends force in all directions equally. “By nature, these are very self-destructive products, and they can be very expensive to repair when they break down,” says Stephane Giroudon, business manager for Montabert North America. “As a result, manufacturers are trying to improve operating costs.” One strategy is to reduce the number of parts in the product, especially the number of moving parts. One example is reducing the number of bolts. This reduces the amount of time it takes to disassemble, repair and reassemble the product. “In terms of the bushings, we make them very easy to check, with ‘go’ and ‘no go’ gauging,” notes Giroudon. “It only takes a moment for an operator to look at it. If it is a ‘go,’ they can operate the breaker. If it is a ‘no go’ gauge, they can replace it.” Along the same lines, bushings are field-replaceable. Five or 10 years ago, according to Giroudon, it was necessary to take the complete breaker back to the shop or to a dealer to replace the bushings. “Now it can be done in five minutes in the field,” he says. 3. How Can Operators Achieve Optimal Productivity and Efficiency? Loomis agreed with the importance of selecting the right-sized hydraulic breaker for the carrier. “This is one of the most critical aspects when it comes to productivity,” he says. When a breaker is sized properly, energy will transmit to the working surface. However, if a breaker is too large for the carrier, energy is transmitted in two directions — to the work surface and to the machine. Matching the breaker to the application is just as important. If it doesn’t have enough power for the application, the working steel and hydraulics can overheat and become damaged, again leading to costly downtime and reduced efficiency. Generally, if a breaker consistently runs for 30 seconds without any signs of progress, you should select a larger breaker. You should also consider the hydraulic flow and pressure specifications required to effectively operate the breaker. “If the carrier can’t provide enough flow at the right pressure, then the breaker can’t perform with the maximum power, and efficiency is reduced,” said Loomis. Many breakers also feature a nitrogen gas assist, which, in conjunction with the hydraulic oil, accelerates the piston. It is important to maintain and fill the nitrogen reservoir as needed for consistent power output. Using the right working steel in the breaker is also important. “For example, a chisel profile sends impact energy in a defined pattern when working to a specific relief or following a seam is desired, while a blunt tool sends force in all directions equally with a shattering effect,” explains Loomis. 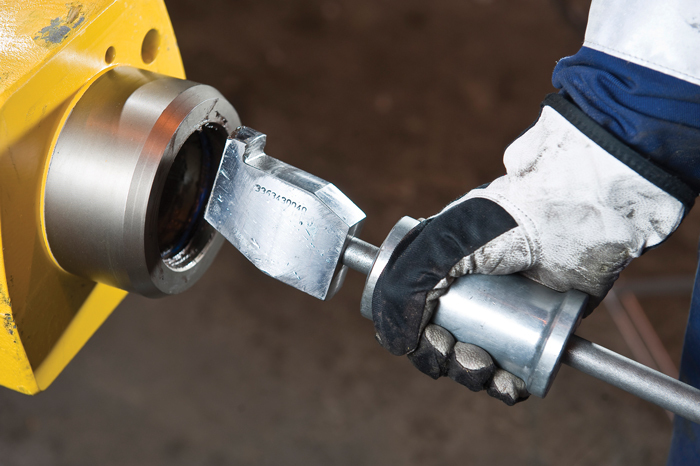 When an operator activates the breaker, hydraulic oil enters its internal porting via the pressure hose and produces the force that drives the piston. 4. What Are the Most Important Maintenance Program Recommendations? Breaking rock is very hard on equipment, so you will definitely need a plan. “It’s important that operators have a maintenance schedule for their breakers and stick to it,” says Loomis. This will help extend the life of the breakers and tools and keep them operating with optimal power. It’s important to check wear parts, like the working steel bushing, which will eventually need to be replaced on every breaker. “It is also a good idea to perform a flow test at least once a year to ensure the carrier is delivering the correct hydraulic input to the breaker,” says Loomis. According to Giroudon, the market is moving more and more toward maintenance-free breakers. “However, there are still some requirements,” he explains. “For example, you need to check the wear on the breaker, make sure to keep it greased, and so on.” In addition, he suggested, every eight months or so, or at least once a year, bring the breaker back to the shop or dealer to open it up for inspection. William Atkinson is a freelance writer for Compact Equipment, based in Carterville, Ill.